The student-edited Body Text publishes the sharpest undergraduate scholarship by Haverford students in the Humanities and Social Sciences. The editors believe that students' academic writing should travel beyond the classroom and through larger interdisciplinary circuits. 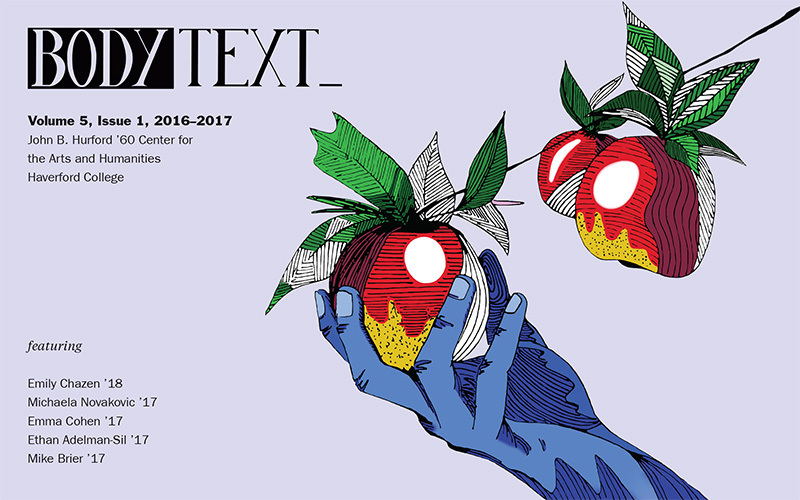 Body Text aims to showcase provocative student writing and facilitate conversations across the disciplines. We look for papers that are accessible, clearly argued, and stimulating. If your paper is selected for publication, we'll work with you through a collaborative editing process to prepare the final version for the journal and its audience. The entire review process is anonymous up until the point of selection. Remove all identifying information from the essay, write an abstract (around 200 words) if the paper doesn't have one already, and email it as a Word document (.doc or .docx) to bodytext.journal@gmail.com. Your essay should arrive as an email with the subject "Body Text Submission, [Paper Title]." Submissions must be formatted in the citation style appropriate to the standards of the paper's discipline. Featuring the work of Emily Chazen '18, Michaela Novakovic '17, Emma Cohen '17, Ethan Adelan-Sil '17, Mike Brier '17, and the Body Text Editorial Board. What is your class year? What is your major or intended major? Why are you interested in becoming a member of Body Text? What elements are most important to your own writing? What do you look for in another’s writing? If you could write an essay about anything, what would it be and why? If you have any relevant editorial experience please note that in your application, but no experience is necessary to apply! Email applications to bodytext.journal@gmail.com by Sunday, September 30th, 2018. Margin is Haverford's themed student-edited publication. Each issue features a topic marginalized in academic discourses, presenting submissions of critical essays, reviews, creative writing, visual media, and any other artifacts that critically or creatively engage the theme. The Margin Editorial Board seeks to publish the work of students, scholars, artists, musicians, and writers, both from within and outside of the Haverford community. We encourage all interested students in applying for a position on Margin’s Editorial Board. Enthusiasm is necessary, editorial experience is not. Please list and briefly describe any prior experience you have that makes you a good candidate for this position. Please list 2-3 theme ideas for our next issue, and briefly explain what the theme might include. Past themes have included: Extra, Hair, Food Fight, Diva, and Cash. Please attach a creative work—poem, essay, visual piece, video, anything you deem creative—and write a brief statement analyzing it. What is important about it? What is controversial about it? Does it successfully do what it intends to? Why do you like it, hate it, feel okay about it? What are some interesting themes that this piece could fit into? Email applications to margin.journal@gmail.com by September 30, 2018. We encourage all interested students in applying for a position on Margin’s Editorial Board. Enthusiasm is necessary, editorial experience is not. Those who are interested in applying should complete this application by October 4, 2017. Required format: Written pieces must be submitted as Word documents with a .doc or .docx extension, and must use proper MLA citation style. Visual pieces must be saved as high-quality .tiff files.